The Kentucky Poor People’s Campaign is returning to the state capitol Tuesday to protest a new emergency regulation enacted by Governor Matt Bevin. The new rules require those wanting to assemble at a state building to submit an application ten days in advance of the event. Last summer the group held a series of statehouse protests in Frankfort and 40 other state capitals. Reverend Megan Huston, a pastor of First Christian Church in Bowling Green, participated in those protests last year and will be in Frankfort for the event Tuesday. “Lobbyists have no trouble getting into the capitol building but then you gather clergy and people living in poverty, people who lack access to healthcare and they are the ones who are restricted,” she told WKU Public Radio. Kentucky was the first state to restrict statehouse access to the Poor People’s Campaign. The Kentucky State Police Commissioner last year directed State Troopers to allow only two activists from the group to be inside the capitol at the same time. Attorney General Andy Beshear later issued an opinion saying the targeted enforcement of such rules was unlawful. Huston said the Poor People’s campaign agrees with the idea that there's a state of emergency in Kentucky, but for different reasons. Huston said she believes the Poor People's Campaign has obtained the permits they need in order to be at the Capitol on Tuesday. 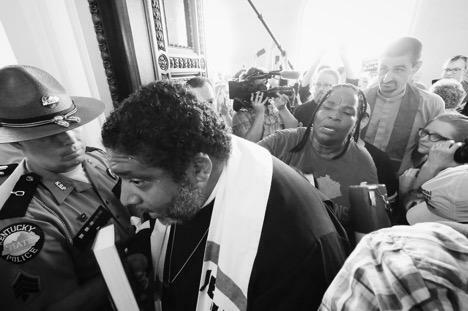 State troopers only allowed two members of the Poor People’s Campaign to enter the Capitol at a time after a series of recent protests, including a demonstration where 17 people spent the night in the building after business hours. But a legal opinion published by the attorney general’s office said that Kentucky State Police and the Finance and Administration Cabinet didn’t create the policy using the proper procedure. Protestors gathered outside U.S. Senator Rand Paul’s Bowling Green office Saturday in support of changes to federal immigration policy. An estimated 200 people rallied in Bowling Green as part of a national “Families Belong Together” campaign. The group is calling for an end to President Trump’s “zero tolerance” immigration policy. Sabina Husic came to Bowling Green as a refugee with her family. Bowling Green is a refugee resettlement area and home to many Bosnian immigrants. Husic said America was something that her family dreamed about but never thought was possible. Becca Schimmel spoke with leaders of the Poor People’s Campaign about their goals and their roots in a half-century of activism aimed at ending poverty. Attorney General Andy Beshear’s office is reviewing a new emergency regulation recently enacted by Governor Matt Bevin impacting public access to state buildings and facilities. The new rules require those wanting to assemble at a state building to submit an application ten days in advance of the event. “And that could be potentially problematic because if you take an example of last year when there were more or less spontaneous reaction to and demonstration against the pension reform measure that seemingly wouldn’t pass muster under the new administrative regulation,” said Michael Abate, a Louisville based attorney with experience in media and constitutional law.